Book Drunk: Review ~ Poppy Does Paris by Nicola Doherty. 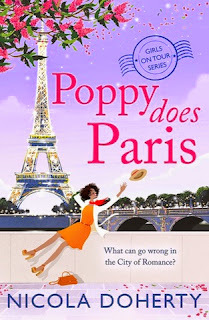 Review ~ Poppy Does Paris by Nicola Doherty. Title: Poppy Does Paris (Girls on Tour #1). Release Date: July 17, 2014. The first instalment in this hilarious, romantic and unputdownable five-part series. Perfect for fans of Lindsey Kelk's I Heart... novels. Paris. City of love, city of romance. The last place you want to go to on a work trip when you're in the middle of an epic dry spell. But that's where Poppy is headed, along with her colleague Charlie, who's shallow and annoying but very, very good-looking. During a white-wine-fuelled session with her friend Alice, Poppy concocts the perfect plan: work by day, and have some no-strings fun with Charlie by night. Of course, it might prove a little more complicated than that, but it's nothing Poppy can't handle - or is it? I love Nicola Doherty’s books for what they are – fun, light-hearted romances. Her writing never fails to put a smile on my face and so I have been really looking forward to her Girls on Tour series. Poppy Does Paris has a stunning cover and I loved the book even more. Poppy was a great character – she was very funny and easy to like. Right from the first page when she’s describing herself for her internet dating profile, she had me cracking up and her story carried on in the same ridiculous, entertaining vein throughout. As Poppy has her bright idea to end her dry patch and have a dirty weekend with her colleague Charlie, the book takes us to Paris and introduces us to more flawed but equally amusing characters like Jonathan and Constance. Paris is of course the city of romance but with Charlie, that wasn’t necessarily what Poppy was looking for. The setting of Paris is built up really well and all the name-checking of various locations there could easily make you want to visit it yourself. Just like Charlie, I’ve never been to Paris either but I could picture it. I loved the simple, silly things like the person carrying the baguette and the moments when Poppy wanted to try out her French but everyone kept talking in English to her. The dialogue in this book was fun and witty and brought the characters to life. Nicola is a really charming writer and she always writes amusing characters and adds in that one that you just love to hate too. Poppy Does Paris is only book one in this Girls on Tour series and I’m really excited to read the rest of it. This was typical chick-lit packed with a few twists, drama and romance and is a brilliant novella to be pushed to the top of your summer reading list. You can only laugh and smile at this fairly comical plot and I loved it! Review ~ Where Love Lies by Julie Cohen. Author Interview ~ Pippa Croft. Giveaway ~ The Fixed Trilogy by Laurelin Paige. Review ~ By My Side by Wendy Lou Jones. Review ~ The Marvellous Cakery by Laura Gavin. Review ~ Flirty Dancing by Jenny McLachlan. Author Interview ~ Liz Fenwick. Review ~ Snake Typhoon! by Billie Jones. Review ~ The Heart of Bali by Rebecca Raisin. Release Day ~ Road Tripping by Noelle Adams. Review ~ When Alice Met Danny by T.A. Williams. Author Interview ~ Joseph M. Rinaldo.